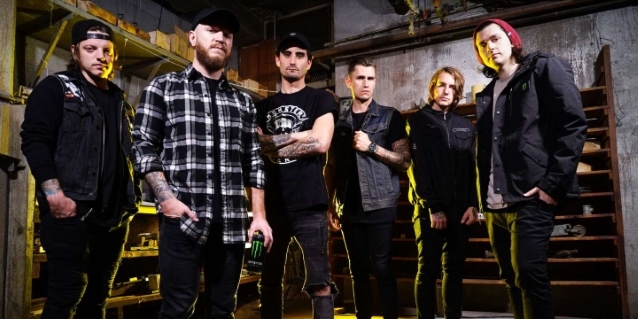 The surviving members of WE CAME AS ROMANS have announced that they will honor their fallen singer Kyle Pavone by going ahead with their previously announced U.S. tour as the support act for BULLET FOR MY VALENTINE. Co-frontman Dave Stephens revealed the news in a video that was shared to the the Michigan metalcore act's Facebook page. He said: "The last few weeks, Kyle's family, his fans, his friends and the five of us have been experiencing a very wide range of emotions, and for us, it's been the most difficult time of our lives. Through this, we've been trying to be very honest with each other and open about how we're feeling and grieving. "So, through all that, we've decided that the best course of action for the band is to do the BULLET FOR MY VALENTINE tour. We feel like this honors Kyle, and we can talk about his foundation, the Kyle Pavone Foundation, and carry on doing what he would've wanted us to do, and us be together on stage, playing music together with our fans. "We will not be replacing Kyle. We will be continuing on, the five of us, and honoring his life for the next few weeks while we're on tour." According to Stephens, WE CAME AS ROMANS' first show on the BULLET FOR MY VALENTINE tour will be Tuesday, September 18 at the The Pageant in St. Louis, Missouri. Pavone died of an accidental drug overdose in late August. According to TMZ, his girlfriend told cops he had gone into the bathroom at his home for a long time, and when she went to check on him, she found him unconscious, feet away from a used syringe. The police report said the syringe was found on the counter of the bathroom sink. Police say the girlfriend also revealed Kyle had struggled in the past with heroin use. A toxicology report is still pending. TMZ originally reported that Kyle was transported to a Michigan hospital on August 19 and pronounced dead six days later, on August 25. WE CAME AS ROMANS' fifth album, "Cold Like War", was released last October through SharpTone Records. A week before his death, Pavone tweeted, "Will i be remembered or will i be lost in loving eyes," a lyric from the song "Promise Me" from "Cold Like War".